The Sonicare 2-Series and 3-Series have been eclipsed by the more recent Sonicare ProtectiveClean models. We recommend you check them out. 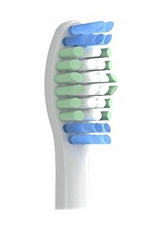 Are the Philips Sonicare 2-Series or 3-Series still worth buying? Maybe, at the right price. At the right price the Philips Sonicare 3-Series has something to offer, but the 2-Series is a weak choice with better alternatives available. They are both compatible with all of the major Sonicare brush heads, so there’s no worry buying replacement brush heads that you might not be able to use if you ever decide to upgrade. The noticeable difference, and showing of age, is the 31,000 brush movements per minute speed, which is the output of both of these models. This is equivalent to about 15,000 strokes per minute. It’s important to realize that with the more recent models they have started describing the speed as “brush movements per minute” instead of “strokes per minute” on most of their specifications. This is important to realize as you might be inclined to think some models are slower than others when you read that a Sonicare DiamondClean model has 62,000 brush movements per minute, and then reading 31,000 strokes per minute on another specification table for a different model. The Sonicare 2-Series and 3-Series are listed as having 31,000 brush movements per minute on the Sonicare website. This means they’re slower than the majority of the other models. Does that mean you should not buy them? We don’t think so. The Sonicare PowerUp Series is powered by AA batteries, has the same speed as the 2 & 3-Series, and people still complain they are too intense. You can always simply brush longer if needed. Now, if you’re still interested, we’re going to take a look at the differences between the 2-Series and 3-Series, while also showing you why they may or may not be a good choice for you. Let’s begin with a summary comparison table, then you can check out our analysis below. Notice we have also included the comparable Sonicare ProtectiveClean model so you can make a better decision. Keep in mind that there are several color options available for each model, we just chose one to show here. You might notice there is a feature in the table we haven’t mentioned, BrushSync. This is a newer feature that allows the handle to recognize the brush head that’s attached to it and keep track of how long it has been used. After 3 months of use, the BrushSync reminder will light up on the handle to let you know when to replace the brush head. The 3 months replacement time assumes you do two 2-minute brushing sessions per day. You may decide the brush isn’t ready to be replaced and go longer. It’s up to you. The NiMH battery is a weak point for the Sonicare 2-Series. We much prefer lithium-ion, and the new ProtectiveClean series takes care of this problem. The Smartimer feature is available on all models and is very helpful for making sure you brush the entire recommended 2 minutes and don’t miss spots. If you’re not familiar with the Quadpacer, it is a 30-second timer that lets you know when to switch to the next section of your teeth. So if you’re brushing for 2 minutes and you divide your teeth into quadrants, then you want to spend 30 seconds in each quadrant. The idea is to make sure you spend equal time in all areas and don’t miss spots. There is another difference between the 3-Series and ProtectiveClean 5100 model that might not be so obvious. With the 3-Series, you get a single brush mode that has 3 different intensities. With the ProtectiveClean 5100, you get 3 brush modes that have the same intensity. What’s the difference between the brush modes? Clean – Standard mode that runs at 31,000 strokes per minute. It’s the base setting on all Sonicare models. White – After the 2-minute program you get an extra 30 seconds to polish problem areas. Effectively just a 2.5 minute brushing session. Gum Care – After the 2-minute program you get an extra 1 minute at reduced power to massage your gums. Note that the 2-minute brushing period for all of these modes operates at the same speed. There is no intensity change except for the period after the main 2-minute session. So the 2-Series and 3-Series already operates at a slower speed than the ProtectiveClean, and the 3-Series gave you the option to reduce or increase the speed with 3 settings. For this reason, the ProtectiveClean isn’t a 100% drop-in replacement for the 3-Series if you like to be able to change the intensity. To get that you have to go with the ProtectiveClean 6100 model. It’s up to you to decide if the intensity settings are important to you, as there is some price difference between the ProtectiveClean 6100 and the other models. Q: Does the brush head have a plastic cover to keep it clean when not in use? Q: Is there supposed to be a gap between the brush head and handle? A: Yes, this is entirely normal and intended. This space gives the brush head room to vibrate properly and produce the designed brush speed. Q: Should you leave the handle on the charger all the time? A: Philips doesn’t recommend storing the handle on the charger. It’s a good idea to charge it every few days, but keep it off the charger in between charges. Q: Are the Sonicare 2-Series and 3-Series waterproof? A: Bringing them into the shower is not a good idea. They are water resistant and can be rinsed with water, but you don’t want the handle getting continuously soaked. The 3-Series does not lack any significant features, but it is beginning to show some age. The newer ProtectiveClean models are a better alternative that is around the same price point. The 2-Series has a NiMH battery which is a concern due to the poor lifespan. If you can find the 3-Series at a good price, then there’s nothing to lose. Otherwise, check out the more recent models in the ProtectiveClean Series, or FlexCare Plus.